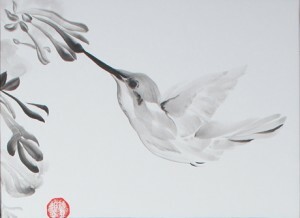 Sumi-e (East Asian ink wash painting) largely informs my work. Meditation and planning are essential. It is impossible to correct the line once on paper. My hand betrays my inner state, requiring a balance of self-control and spontaneity. Before I begin I distill my subject’s essence in my mind. Every brush-touch must be full-charged with meaning, with useless detail eliminated. When I paint a flower I am freed from reproduction and inspired to convey its movement and fragrance. What nature gives and creates for us is an absolute wonder from herself, “Mother nature”.